We asked our hosts of our wonderful accommodation if they had heard a weather forecast for the day. Her response was “settled”. To us it looked overcast and likely to rain so we packed our raincoats. 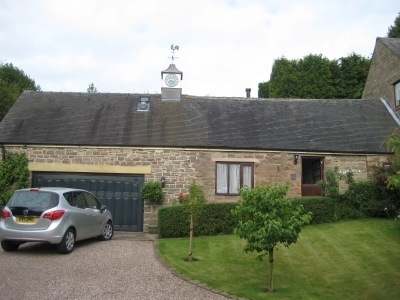 We are staying in a place called Wheatcroft, a mere dot on the map, about a ten minute drive from Matlock in Derbyshire. It is reached by driving along capilliary like laneways while holding your breath, hoping that a car won’t come towards you from the opposite direction as one of you will have to reverse – a long way. The barn is attached to the owner’s house and has oak beams dating from medieval times. 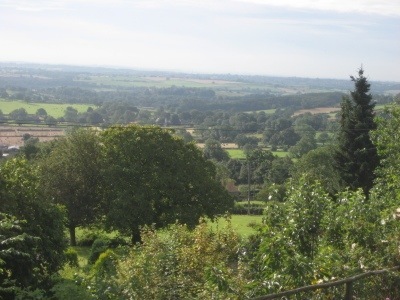 We have a tiny balcony with an enormous view – “you can see five counties” our host proudly told us – back home, you would say “you can see for miles and miles”. Remember Oxford? We wanted to walk and I had trouble finding maps? Here, we have a box of maps and suggested walks – hundreds of walks that would take an entire lifetime to do. We now faced the dilemma – which walk? We only have a few days. 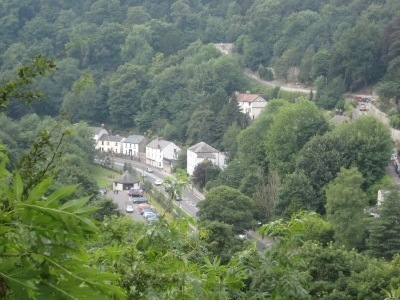 We were unprepared for the beauty of Matlock. It is nestled beside the Derwent River in a steep valley. The houses are made from a grey stone. 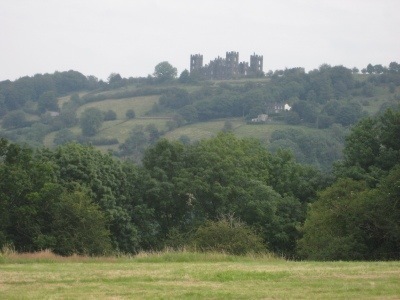 On top of one of the hills stands Riber Castle. The river is lined with sheer cliffs that are steep and are a mountain goat’s paradise. 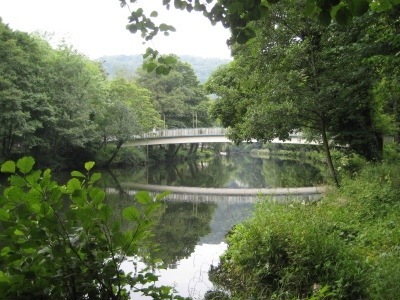 We chose a walk that takes you from Matlock down the river towards Matlock Baths, another village and then a return on the other side of the river. The “settled” weather made the colours soft and muted, but the views were breathtakingly beautiful. We climbed up and up to the top of a sheer cliff face called High Tor. We could hear jazz music playing on the other side of the river and at times we didn’t want to look down – as it looked like a very long way to fall. We finished with a stroll along “Lover’s Walk” built in 1740 – surprisingly empty and very quiet. 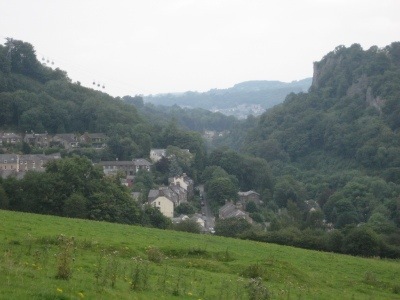 We emerged into Matlock Bath into a cacophany of colour and sound. This was the day for the bikies to visit in their hundreds – dressed in their leathers, covered in tatts wiith their bikes gleaming. 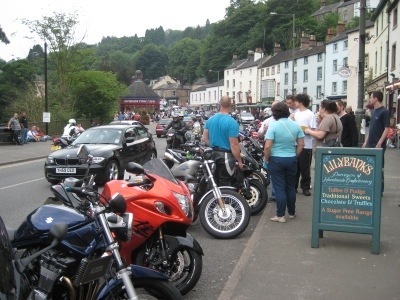 They were parked everywhere and the pubs and cafes were filled with them – they were having a brilliant day out and proudly showing off their toys. Keith and I felt distinctly underdressed and under-tatted. 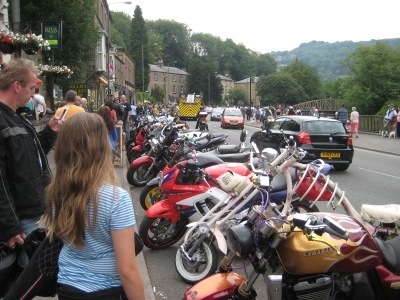 After joining them for a quick lunch, we headed off and up and up to return to Matlock. The heavens opened and we were glad we had brought our raincoats.